I've been working on mathematical models for optimum split pacing for the past 12 years or so, but I'd be interested in any published and/or internet-available resources which talk about such things. Re: Optimum split pacing ? Swimming, speed skating and track cycling events at international level sometimes publish split data. I remember seeing the Beijing Olympics swimming data in particular, 50m splits in 200 and 400m events. In general if resistance is proportional to the square of speed and power to the cube (as in air and water), overspeed is unsuccessful. In rowing without good style no split strategy can help anyway, we go too slow. You can see the devastating effects of bad style at Henley Royal Regatta this year, in the Princess Elizabeth Cup. Watching Popov, one is inclined to think the same goes for swimming too. Race tactics??? is there any on a erg??? It's relevant in that most of the pacing studies I'm aware of are based on analyses of reported results. They're usually couched in terms of 'winners tend to do X,' from which it's typically asserted that if you follow a similar pacing strategy you're likely to achieve your fastest result on the day. However there's no good way after the fact to separate out tactical/competitive influences on pacing. And what race winners do/don't do shouldn't automatically be assumed to be optimum for rowers back in the pack who are looking to PB. Even less so for those doing trials by themselves. Or to put it another way, physiologically optimum and competitively optimum aren't necessarily one and the same. To respond directly to the OP, if you don't already know it, S. W. Garland, "An analysis of the pacing strategy adopted by elite competitors in 2000 m rowing" covers OTW rowing and is available free on line at An analysis of the pacing strategy adop ... 0 m rowing. It is a common misconception that because resistance in rowing is proportional to the square of velocity and power to the velocity, overspeed will be unsuccessful. In truth, overspeed is unsuccessful primarily for physiological, not physical reasons. or the cost of using an uneven pace was only .28s or 1.55meters or 1.5 seats. The problem with overspeed is that if you are not careful, it overtaxes the anaerobic system. Your body's flight of fight response says too much O2 debt, flight is not working so best to slow down and prepare to fight. Your heart rate drops and you can't get it up to maxHR until you breathe off some of the Oxygen debt. Except that analyses based on pace/power output don't take into account physiological and/or biomechanical features of input. That is, what you see on the monitor screen tells you how fast the rower is going but doesn't tell you how (or why) s/he is going that fast. And you can't assume that all available energy systems are contributing in the same proportions at all times during a trial or race, nor that the same muscles are contributing sequentially in constant proportions to moving the handle, nor that other factors potentially affecting leverage like stroke length, body lean, compression, handle height, etc. are constant. I started out rating higher than average for the first 250m or so, settled down to a kind of 'cruising' pace/rate in the middle 1500m, and put the hammer down at the 1750m mark. Both pace and rating tailed off in the last couple of strokes because I was winning handily enough that there was no particular need to row flat out through the finish. I submit that this sort of pattern, to greater or lesser degrees of resemblance, is typical both OTW and OTE (at least at the elite level, and especially in multiple-rower boats, water rowers typically rate considerably higher both in their starts and also in the body of their races). And I'd like to suggest that it's because those who do it are holding overall input effort per stroke relatively constant while using the higher-rated starts and finishes to go faster than they otherwise would/could. Moreover, I think it likely that in the process, they're altering subtly the mix of physiological and biomechanical factors that make up a given unit of rower grunt at any particular moment. It should be noted that this study has only shown the self selected pacing strategy used by rowers, but has not necessarily shown the physiologically optimal pacing strategy, nor provided physiological evidence as to why the first 500 m sector is rowed faster than the other sectors. Although there are notable tactical and psychological reasons for starting fast, at least for on-water rowing, it is less easy to identify physiological reasons why this is the adopted strategy. Possible mechanisms for enhancing performance by starting quickly include an accelerated increase in blood flow, ventilation, and/or oxygen uptake which may attenuate fatiguing mechanisms later in the race. These were not investigated in this study, and further, laboratory, work is required in this area. I agree completely with the call for more research, and hope the OP (and other contributors to the thread) can provide some. When we are near our limits, it costs us a lot more to speed up by a second per stroke than we can gain by slowing down one second. That's why we all try to row consistently at a target pace, with a variation of +/- one second instead of +/- two or three seconds. The same logic applies over the time span of an entire race as over the span of a few seconds. Flat splits make the most logical sense. But I use negative splits more for psychological reasons. I think of it as trying to minimize the amount of time that I spend in discomfort, or in the pain zone. My usual strategy is 800m at target pace +1 second, 600m at target +0 second. After 1400 meters I'm still not feeling really terrible, and I can do the remainder as 400m at target -1 second, 200m at target -2 seconds. By the time I reach my last 20 strokes, despite the fact that I am hurting I can usually hang in until the end. If I were doing flat splits or positive splits I would be spending more time in pain. In short, it's all extremely complicated and not particularly well investigated. True, but real oarsmen and ergers like you know what to do. Most 2k erg races show only the 500 m splits, which is not sufficient for analysis. In reality an eight in my day pulled ten strokes at about 40, then dropped to race rating, 32 - 34 reached after not more than 25 strokes, then sprinted (but only if strictly necessary) for the last 20 - 30 at most. Afloat, ratings are governed by the rhythm they generate, as anyone who's sat behind a good stroke will know, and it's essential to cruise most of the race with a comfortable rhythm. What appears to be race tactic is the result of this necessary method. Your fastest time is obtained by getting to your target pace within 4 to 6 strokes and then maintain a constant pace till the finish and die on the finish finish line and not before. The only strategy is the luxury of being able to slow near the finish because your winning so you can conserve energy. The Cubic law of the power required to row on the Erg is a killer. You simply don't want to row faster than your capable of at any time for the race duration. The really hard part is picking your pace, which is not necessarily the same every day because of how you perform on the day. Row too fast at any point and your going to really pay for that later on because you will have to slow down. Your overall time will then be worse. The minimal energy required for the fastest time is a constant pace. When I say "Minimal" this is going to be your "Maximal" effort. Your really racing yourself and no one else so you need to be able to stick to the plan from start to finish and that can be very difficult in itself. Going back 40 years, my best 2ks (or the equivalent) have always been flat. Always hope I'm going to have a sprint, but I end up in the last 500 just warding off the darkness. Anything 1k or below my best tends to be slightly positive split and for 5ks and that ilk, my bests are negative splits -- stretched out versions of your 2ks. Maybe I'll see you at CruFit, next weekend. Chris, you've stumbled onto my secret identity. I've watched that race you did two years ago many times on youtube. You always win. It makes me happy Going back 40 years, my best 2ks (or the equivalent) have always been flat. Always hope I'm going to have a sprint, but I end up in the last 500 just warding off the darkness. Anything 1k or below my best tends to be slightly positive split and for 5ks and that ilk, my bests are negative splits -- stretched out versions of your 2ks. Maybe I'll see you at CruFit, next weekend. I have watched that race a few times too - Chris of course does always win it which makes me less happy! I agree with the flat but negative split strategy too in general. On that day though I decided to go out harder than usual to find out if Chris was up for the race - he was! - he was unbeatable that day. Hope to see you guys at Crufit again too sometime. Remo were you there the day I did the class with Chris last year? I'm fully aware that the plural of anecdote is not data. However I'd still like to suggest that there's often a discrepancy between what people think they're doing over a 2k test and what they actually do. MC: How do you look to pace a 2k erg test? EM: I’ve always thought the way to do a good erg was to even-split. So I might be on 1:27s the whole way, rating 35 to 36 strokes per minute. Towards the end the rate creeps up to 37 and 38 but you don’t increase your speed because you’re pulling max watts. I’ve tried to let it slip up and then wind it to 1.24 splits at the finish, coming in at a high rating like 46. But if you blow up in last 500m you lose. In other words, despite the stated preference for even splits, on this day a self-selected "classic" pace profile with a slightly faster than average start, something of a 'settle' in the middle half of the piece, and a push in the last quarter involving a modest rate-for-pace trade. 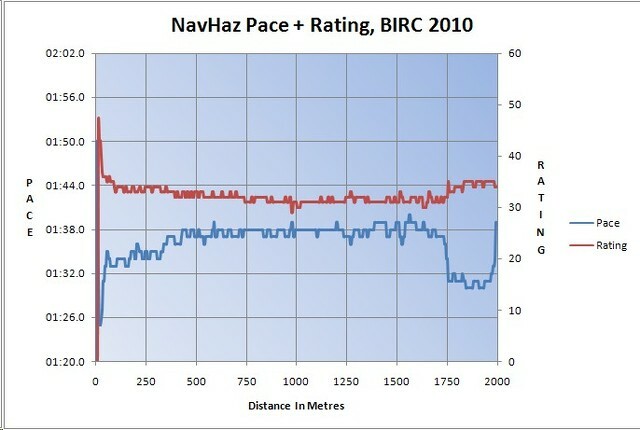 Rounded, the splits were 101.1%, 99.7%, 99.0%, and 100.0% of his average 1:25.45 pace. Given that Murray was a world-class OTW rower, and that elite OTW rowers typically follow this sort of profile in regatta settings (see Caviston's data referenced earlier in the thread, or if you have journal access https://www.tandfonline.com/doi/abs/10. ... 0903426659), it's possible that he did this more or less unconsciously on the erg because that's how he'd likely have done it on the water. And we'll never know whether he could have done better on the day had he gone out at 100% of what turned out to be average pace, i.e. 1:25.4, as Caviston in the aforementioned thread suggests.